Lodging options in Ojai can be limited and tend to fill up quickly. Discover lodging possibilities on our lodging page. Relive the 66th Ojai Music Festival with Music Director Leif Ove Andsnes and friends from the comfort of your home! The Ojai Festival’s internship program was by far the highlight of my summer. It’s three weeks of learning, making friends and gaining experience that feels more like a few days at the end of it. My euphonium teacher at UC Berkeley recommended the program to me – I told him I was looking for an arts management internship in Southern California and this immediately came to his mind. I had known about the success of the Festival in years past, and I was sold once I found out about the internship program. I actually applied late, having found out about the program in early May. Luckily for me they had an open spot, and after e-mailing an application and a couple of short essays I interviewed on the phone with Jillian, the intern coordinator. Three days later Jillian informed me that I had been accepted into the program as a Marketing/Public Relations intern, something I was very excited about. Then, after a little more than a month, I arrived at the Ojai Festival. I actually arrived a week later than all of the other interns did, because I was to stay a week later to work on marketing-related projects. Because of this, I arrived on Festival week – after three short days of introduction, it was time to dive into the exciting and fast four days of the Festival. I live near Ojai, but had never before attended the Festival, so it was amazing to me to see how well the event flowed and how smooth the planning was – and of course, how wonderful the music was. During the Festival I did a variety tasks including handling incoming 2013 subscriptions, handing out and recording audience surveys, and taking photos during the Festival for social media purposes. The retail interns handled the large books both with CDs, the box office interns attended to the influx of ticket orders and will call, and every other intern had something specific to attend to. Some handled special events, some backstage, some the front desk, and so on. After a little over 72 hours, all of the events were done and Libbey Park no longer glowed with green lanterns. The next week, the final week for most interns, involved finalizing and approving what had happened during the Festival and getting ready to say goodbye. We had become a little family over the Festival – the intern program had students from a wide variety of schools, from Washington to Texas, from the Bay Area to Southern California. Many interns come back year after year, but many do not because of scheduling issues. It was such a great experience to meet people that have the same passions as I did and connect with fellow music lovers. I am very, very happy my euphonium teacher mentioned this program to me – I believe it has helped me greatly with my understanding of a successful non-profit and of the ways in which music events work. I know I will be using this experience in my future internships and jobs with arts management. To apply to the program or for more information, click here. “On the advice of my lawyer, I’m not going to tell you what I’ve planned for 2014,” joked Ojai Music Festival 2014 Music Director Jeremy Denk at the Sunrise Breakfast. The joke was half-serious. Denk, in conversation with Performance Today’s Fred Child, revealed a few things over the course of a discussion that ranged from Denk’s 2001 residency on Performance Today – an hour every morning for a week of interviewing and performing – to why Denk double-majored in chemistry and music performance at Oberlin. Child and Denk spoke in front of a crowd of donors at the Ojai Valley Inn and Spa after OMF artistic director Tom Morris chatted a little about the status of sales for this year and for next – about 700 tickets had been sold for 2013 by the fourth day of this year’s festival – and Denk, who performed at the Festival with eighth blackbird in 2009, said that he was nervous the first time he was here and didn’t get to fully appreciate the atmosphere. But on Thursday night, as he listened to Marc-André Hamelin play the Concord Sonata, he started settling into the beauty of nature and thinking about the ways nature “and all its colors” could play out in the programming for 2014. Mr. de Leeuw is an accomplished pianist – he will be performing his own Im wunderschönen Monat Mai on Friday Night with Barbara Sukowa. His interpretations of Erik Satie, in particular, have brought him widespread acclaim. Here’s a video of him playing Satie’s Le Fils des Étoiles No. 2. In addition to his work with the Schoenberg Ensemble, Mr. de Leeuw has also served as music director of the Tanglewood Festival of Contemporary Music (1994-1998) and artistic advisor for contemporary music at the Sydney Symphony Orchestra (2000-2004). He has also been involved in several opera productions, including works by Stravinsky, Andriessen, Ligeti, Vivier, and Rob Zuiddam. In 2011, Mr. de Leeuw accomplished a cherished dream – to lead a complete performance of Schoenberg’s massive Gurre-Lieder. For his performance, de Leeuw brought together 356 musicians, including students of the Royal Conservatoir and Codarts Rotterdam. Here’s a brief video taken from one of the rehearsals. If that isn’t enough, Mr. de Leeuw is the author of two books (one on Charles Ives and a collection of essays), and helped to create an internationally acclaimed eight-part documentary on twentieth-century composers. And one more…In 2010, Mr. de Leeuw was a part of the “Cage Against The Machine” campaign, which was a worldwide push to get John Cage’s 4’33” as the Christmas No. 1. Here is his performance for Dutch television (begins at 6:30). If anyone speaks Dutch, we’d love to know what he says! We’re excited that Reinbert de Leeuw will be joining us in June. From what we’ve seen so far, he’s an incredibly talented musician and thinker – we can’t wait to meet him! He’ll be in Ojai June 7-10 – click here for tickets and further information. At our Preview Events last weekend, hosted by Artistic Director Tom Morris and ArtsJournal.com founder Doug McLennan, we asked attendees to tell us what they thought and what the most interesting thing they heard was – here are a few of the comments we received. Thank you to all of our friends who attended our events in Ojai, Santa Monica, and Pasadena; it was so wonderful to meet you all! Needless to say, with less than two months to go, excitement for the Festival in June continues to mount. We hope to see you there – purchase your tickets today. The group was started in 1977, bursting onto the international music scene with its acclaimed recording of Grieg’s complete works for string orchestra in 1979. The NCO has benefited from having two long-term leaders: Terje Tønnesen (1977-1981, 2010-present) and Iona Brown (1981-2001). Leif Ove Andsnes was the orchestra’s first guest leader, holding the position from 2002-2010. Terje Tønnesen is active across several different genres, enjoying working in jazz, rock, and theatrical performance in addition to his work with the NCO. Here’s an incredible video of Tønnesen performing in Dance Macabre (1995), choreographed by Kjersti Alveberg. The NCO is known for their dedication to developing new performance concepts and modes of presentation. Take, for example, their performance of Grieg’s In ‘Holberg’s Time’, in 2010 (wait for about 50 seconds in). The NCO appeared as part of the BBC Proms in 2010, receiving almost universal praise for their (and Andnes’) performances of Grieg and Mozart’s piano concertos. But they gave another performance as well, at the much less traditional 100 Club, usually home to Jazz and rock groups. You can see a video of their sold-out performance here. And speaking of unusual venues, the NCO also had a series of performances throughout the city, including in a train station. Definitely one of the times we wish we spoke Norwegian. There are less than two months to go until the Norwegian Chamber Orchestra, Leif Ove Andsnes, and the rest of the 2012 artists arrive in Ojai. If you have not yet bought tickets, you can do so online at https://ojaifestival.secure.force.com/ticket. When you and Leif Ove Andsnes perform works for four hands, how do you decide who plays which part? It’s only happened for two pieces so far, so there’s no great tradition yet! If one of us expresses a preference, the other respects it; that’s all there really is to it. Incidentally, we’ve only played 2-piano pieces so far — nothing on just one piano. How do you decide the balance between solo, chamber, and orchestral appearances? Do you have a preference? What are the attractions of each? It all depends on what concert offers come my way. I tend to take all I can, whether solo, chamber or orchestral, provided my schedule doesn’t get overcrowded; beyond a certain number of concerts, the quality of what I do is bound to start to suffer. You have played pretty much everything…is there anything left, or will you turn to composition full-time? I find this question extremely amusing! If one could play literally everything ever written for the piano, it would take at least twenty lifetimes! It’s not generally appreciated just how much there really is. True, a lot of it is forgettable or out of fashion, but there’s still many good things out there waiting to be heard. As far as composition, it’s a necessary thing for me, and I enjoy it tremendously, but my concert activity will always be my main priority. Desert island music question! What are the five recordings you’d want if you were actually stranded on an island? (box sets don’t count). Do you have any favorite pianists among the legendary figures of the past (or present)? Any favorite recordings or concert experiences? When I was little, my father played a lot of the Golden Age pianists’ recordings — those were his favorites by far, so naturally I got to know and love them very much. I liked a lot of them — hard to pick one. Ignaz Friedman and Josef Hofmann, perhaps. As far as now, people like Freire, Lupu, Uchida, Ax, Andsnes and Zimerman…well, the world would be much poorer without them. Two of the concerts that particularly affected me (in a positive way!) were Shura Cherkassky’s two Montréal appearances back in the late 70s, when I was an impressionable youth. If you weren’t playing piano, you’d be…. A master of ‘air chess’! No, seriously…I have a certain aptitude for languages (even though I only speak two) so maybe a linguist? Thanks to everyone who sent in their questions, and a big thank you to Marc-André – we can’t wait to see you in June! If you’re interested in seeing Marc-André Hamelin perform at the 65th Ojai Music Festival, click here for a program schedule. Just before the new year, influential music critic Alex Ross released several end of year lists. He named the Festival’s own Thomas Morris as one of the Persons of the Year, and released his list of the greatest performances of 2011. One of the selected highlights was the performance of John Luther Adams’ “Inuksuit” at the Park Avenue Armory in New York. Written for Steve Schick, Inuksuit–the title is derived from the stone cairns used by the indigenous peoples of the Arctic–is an arresting piece for 9-99 percussion performers who are located throughout a large space (it was originally intended to be performed outdoors), allowing audience members to remain stationary or to move through the performers at will. Watch excerpts from the Armory performance. Lucky for us, we don’t have to travel to New York to witness Inuksuit. The 2012 Festival will kick off with the piece’s West Coast premiere on Thursday Evening at 5pm. The premiere will be a free community performance featuring 48 percussionists led by Steven Schick, including professional musicians, music students from Southern California universities and colleges, and local musicians from Ojai. They will be placed throughout Libbey Park and Bowl to create a truly unique, interactive musical experience. Luther Adams is no stranger to such intersections and interactions between space and sound. Described by the New Yorker as “one of the most original musical thinkers of the 21st century,” his works take the vast natural landscapes and the indigenous cultures of his adopted Alaska as their inspiration. Spurred by his deep interest in environmental conservation, Luther Adams’ compositions create a bridge between human experience and the natural world, bringing audiences greater awareness and a heightened connection with nature. Many of his works take their material directly from nature itself. In The Place Where You Go To Listen, for instance, Luther Adams used seismological readings and geophysical data in composing. In many ways Luther Adams’ compositions are a perfect fit for the outdoor setting of Libbey Bowl, and the 2012 Festival will feature several of his works. After Inuksuit on Thursday, the evening concert will also feature Red Arc/Blue Veil, performed by Marc-André Hamelin and Steve Schick. Luther Adams’ work returns on Sunday night, where Leif Ove Andsnes will join Hamelin to perform Dark Waves. Click here to listen to a preview. This year’s Festival is promising to be a truly unique intersection of music, place, and idea. If you have not yet purchased your tickets for this year’s Festival, you can do so online, or by calling 805.646.2053. For more information on John Luther Adams and to read his writing on music, composition, and the environment, visit his website. Dances to a Black Pipe, Fröst’s latest CD includes dance music by Copland, Brahms, Piazzolla, and Goran Fröst, Martin’s brother. The CD also features Ojai alums Richard Tognetti and the Australian Chamber Orchestra. Watch Fröst and the ACO recording Dances to a Black Pipe here. Fröst is a longtime collaborator with 2012 Music Director Leif Ove Andsnes, and has been a frequent performer at the Risør Music Festival in Norway. He is the Artistic Director of the Vinterfest in Mora, Sweden and of the International Chamber Music Festival in Stavanger, Norway. Several of his special projects (Peacock Tales, Dance to Black Pipe, No Strings Attached) can only be described as monodramas, with Fröst himself playing the main role and musical lead, creating new ways to convey stories and music to audiences. Here’s a preview of Peacock Tales, which Fröst will be performing at the Sunday Morning Concert. Even royalty love Martin Fröst. He was the only classical instrumentalist featured during the gala concert celebrating the marriage of Crown Princess Victoria of Sweden and Prince Daniel Westling. Fröst will be performing in Ojai during the Saturday Morning and Evening concerts, as well as the Sunday morning concert. Highlights will include his famous performance of Peacock Tales and Copland’s Clarinet Concerto, among other works, among others. Buy tickets to the 2012 Festival here. If you can’t wait until June, he will be performing with the Los Angeles Philharmonic on March 24-25. And finally, a little Friday treat – Fröst and Malena Ernman performing Flight of the Bumblebee. In the concerts of the clarinetist Martin Fröst, the conventional rocks. He put a spell on the Luzern audience. “Very rarely does the clarient get to establish itself so exaltedly as in Anders Hillborg’s Peacock Tales. It is clear that Andnes loves giving – and attending concerts. He is an avid listener and you can be sure he’ll be in the audience of Hamelin’s reading of the Ives’ Concord Sonata, which he calls one of the great musical experiences of his life. At the same time he loves programs that mix solo and chamber works, creating a partnership among equals with no fuss about “billing.” And in this equation he includes the audience, from whom he hopes to draw that same degree of absorbed concentration that characterizes his own engagement with music. – Montreal-born Hamelin is an incredibly virtuosic pianist, known for his breadth of expression and astonishing technical ability. If you need proof, here’s a video of him performing Triple Etude d’Apres Chopin, where he plays three Chopin A minor etudes…simultaneously. – In an interview with Ethan Iverson, Hamelin noted that the first recording he bought for himself was of Ives’ Concord Sonata when he was 13. It has since become something of a signature piece for him…and he’ll be playing it on Thursday night in Ojai. – He is an Officer of the Order of Canada and a Chevalier de l’Ordre national du Québec (National Order of Quebec). – Hamelin has achieved the near-impossible: he has managed to make the Nokia ringtone almost bearable, with his very own Valse Irritation d’après Nokia. Needless to say, we’re looking forward to meeting Hamelin and hearing him play in person. He will be performing throughout the Festival weekend, both solo and with his friend and long-time collaborator Music Director Leif Ove Andsnes, playing works by John Luther Adams, Ives, Berg, Bolcom, and Stravinsky. Click here to see his concerts and buy tickets to the 2012 Festival. If you want to learn more about Hamelin, read Ethan Iverson’s excellent interview or visit his web site. 2012 Music Director and celebrated pianist Leif Ove Andsnes continues his extensive U.S tour. In this recent SFCV web article, he talks about his music and his “big” celebration! – She’s not only a singer, but an accomplished violinist as well. – She is the recipient of several awards, including the ECHO Rising Stars Award (2005/2006) and the Nederlands Muziekprijs (2008). In 2007, she was selected as a BBC New Generation Artist and her recording of Tchaikovsky songs with pianist Julius Drake won a BBC Music Magazine award. – Stotijn has performed with leading orchestras throughout the world, including the Berlin Philharmonic, London Symphony Orchestra, the Royal Concertgebouw Orchestra, the Orchestre National de France, the Chicago Symphony Orchestra, the Boston Symphony Orchestra, and now, the Los Angeles Philharmonic. – She has appeared in major roles with the Paris Opera, the Royal Opera House in Convent Garden, the Nederlandse Opera and the Théâtre de la Monnaie in Brussels. From what we’ve learned, Stotijn is an artist who is not to be missed and we’re excited to welcome her to Ojai in June. You can catch Stotijn in Ojai throughout the Festival weekend, where she will be performing works by Shostakovich, Wagner, and William Bolcolm, among others. Click here to see her concerts and to buy tickets to the 2012 Festival. Learn more about Christianne Stotijn at her website. Gratitude. On this Thanksgiving I want to extend my gratitude to the hundreds of volunteers, donors , audience members, and artists who selflessly give of their time, talent, and money to support the Ojai Music Festival. All of us share a common passion in the interest of exploring the highest forms of creativity expressed through music and sustaining one of the most engaging musical experiences all of us have each year—the Ojai Music Festival. This annual pilgrimage only exists because each of us helps to support it in our own, unique way which makes it a culmination of all of our collective efforts. Thank you for your interest, trust, and dedication to the Ojai Music Festival. 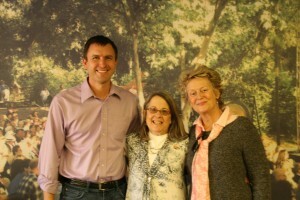 photo caption: At the volunteer luncheon in November, the Festival honored longtime volunteer coordinator Jessica Murray (center). Operations director Gillian McManus (right) helps oversee the enormous efforts of our volunteers with Jessica. Ah, collaborative friendships…sometimes two minds really are better than one. From Sherlock Holmes and Dr. Watson to Spock and Captain Kirk, the “bromance” is alive and well in all areas of popular culture. But they aren’t just for movies or books…if you know where to look, bromances can be found in the world of music as well. For instance, take pianists Leif Ove Andsnes of Norway and Marc André-Hamelin of Canada, who are prolific collaborators on stage and good friends off it. Take a look at this behind-the-scenes video as they prepare for a rehearsal of Stravinsky’s arrangement of Rite of Spring for two pianos as part of Risør in Brussels last year…you’ve got to love the debate over which piano to take! As both artists mention in the video, the piano arrangement offers a different interpretation of the regularly-heard orchestral version, and may not even have been intended for concert performance. Luckily for us, Andsnes and Hamelin are going to bring the dual piano version–and their rehearsal antics–to Ojai for the Sunday Night Concert. We hope you’ll join us and help welcome one of the bromances of the music world to the Ojai Music Festival in June 2012! You can read the complete article by clicking here . Each fall, about 15 of my peers who lead the top classical music festivals of the Western United States gather. This year, we converged in Portland for three days of lively discussion about the future of audiences, role of the Internet in reaching audiences and artists, ways we can collaborate on various projects, and learning more about the artistic successes of each of our pursuits. As I made my way back to Ojai, I was struck by the advantage festivals have over traditional orchestras, in that we have much greater freedom and opportunity to explore a broader range of repertoire and more meaningful ways of connecting to our audiences. 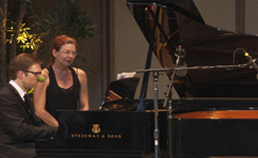 Ojai in particular holds a great advantage in that all of its concerts and events are packed into just four days. There is no other festival that offers so many opportunities in such a condensed time period. This also gives Ojai another advantage that all of its artists are present at the same time. Rarely do audience members or artists come in and out during the festival…you are either in Ojai for the festival or not! While it is clear that each festival is working significantly harder to maintain their programs (Ojai is not an exception to this! ), each of us are still finding new, passionate audiences for our work when we hold a clear artistic perspective and stick with it. Last week’s Annual General Meeting was a bit like the Festival itself…a reunion of close friends getting together, swapping stories and talking about what they enjoyed at the Festival, and of course, what they didn’t. After all, this was the Ojai Festival crowd, and that meant plenty of provocative and lively discussion at every table! There were many highlights to the lovely afternoon at the Ranch House, but what everyone eagerly waited upon was getting inside details of the 2012 Festival from Artistic Director Tom Morris. Tom shared that he and Music Director Leif Ove Andsnes had been working over the past months to craft a program that reflects Andsnes’ wide-ranging and diverse interests. Like the reputable Risor Festival in Norway which he helped co-found, Ojai will embrace a sense of community not only between artists on the stage, but between audience and artists. We can expect some adventurous mix of elements and as Tom said a “wall-to-wall’ weekend of music and discussion. Tom also highlight that Ojai already places music of our time at the center of what it does, but unlike some contemporary music festivals that concentrate on just what’s new, Ojai builds a case for how the music of today fits into the context of the longer musical historical conversation. More discussions on this very topic will start to percolate these next several months and definitely during the Festival. Stay tuned! The New York Times has called Leif Ove Andsnes “a pianist of magisterial elegance, power and insight.” With his commanding technique and searching interpretations, the celebrated Norwegian pianist has won worldwide acclaim, prompting the Wall Street Journal to call him “one of the most gifted musicians of his generation.” He gives recitals and plays concertos each season in the world’s leading concert halls and with the foremost orchestras. Andsnes is also an active recording artist, as well as an avid chamber musician who has joined select colleagues each summer at Norway’s Risør Festival of Chamber Music. He will serve as Music Director of the 2012 Ojai Music Festival in California. Beethoven will figure prominently in Leif Ove Andsnes’s 2011-12 season and beyond, in concerto performances, recitals and recordings. Together with the BBC Symphony Orchestra and Jiří Bělohlávek, he will perform the Third Concerto in London and on tour in Spain. Soon after, he performs the First Concerto with the Vienna Symphony and Andris Nelsons, including concerts in Vienna’s Musikverein. Andsnes will play the same two concertos with the Norwegian Chamber Orchestra in Gothenburg and Oslo. He then heads to North America for a series of fall performances of the First Concerto: with the Pittsburgh Symphony and Manfred Honeck; the Montreal Symphony with Roger Norrington; and, in January, the Boston Symphony under David Zinman, before returning to the Third Concerto, which he performs with the Philadelphia Orchestra and Herbert Blomstedt. Andsnes will play and direct both concertos with the Swedish Chamber Orchestra in Örebro, Sweden; and with the Trondheim Symphony Orchestra in Trondheim, Norway. He will tour with the Mahler Chamber Orchestra in Italy – including performances in Brescia, Lugano, Torino, Bergamo – as well as Dresden, Prague, and Bergen. The Prague concerts will be recorded live by Sony Classical – his label debut – and are the beginning of a multi-year project, entitled “Beethoven – A Journey,” to play and record all five of Beethoven’s Piano Concertos. Other highlights of the 2011-12 season include performances of Rachmaninov’s Piano Concerto No. 3 with Hannover’s NDR Radiophilharmonie, Japan’s NHK Symphony, and his hometown orchestra, the Bergen Philharmonic. While in Japan, he will also give recitals in Tokyo and Nagoya. Music by Chopin, Debussy, Bartók and Haydn will be featured on a recital program in North America and Europe. The first leg of the tour includes performances in Los Angeles; Morrow and Savannah, Georgia; Washington, DC; New York’s Carnegie Hall; Chapel Hill, NC; and Chicago. A nine-city European tour includes performances in Schloss Elmau (Munich), Brussels, Oslo, Paris, Birmingham, London, Florence, Genova, and Berlin. A spring recital tour featuring songs by Mahler and Shostakovich brings Andsnes back to the States for performances with baritone Matthias Goerne in San Francisco, St. Paul, Kalamazoo, Detroit, and New York’s Carnegie Hall. Among the many highlights of Leif Ove Andsnes’s 2010-11 season were two residencies: as Pianist in Residence with the Berlin Philharmonic Orchestra, he performed five diverse programs including chamber music, Brahms’s Piano Concerto No. 2 with conductor Bernard Haitink, and a solo recital. He also served as Artist in Residence with his hometown orchestra, the Bergen Philharmonic. He toured Europe with the London Philharmonic and Vladimir Jurowski as well as Mariss Jansons and the Royal Concertgebouw Orchestra, and performed concertos with the Chicago Symphony Orchestra and Orchestre de Paris. Last fall, EMI Classics released a recording of Rachmaninov’s Piano Concertos Nos. 3 and 4 with Andsnes, Antonio Pappano and the London Symphony Orchestra; in the spring his recording of Schumann’s complete Piano Trios with violinist Christian Tetzlaff and his sister, cellist Tonja Tetzlaff was also released on EMI Classics. Andsnes was born in Karmøy, Norway in 1970, and studied at the Bergen Music Conservatory under the renowned Czech professor Jiří Hlinka. Andsnes currently lives in Copenhagen and Bergen, and also spends much time at his mountain home in Norway’s western Hardanger area. He is a Professor at the Norwegian Academy of Music in Oslo, a Visiting Professor at the Royal Music Conservatory of Copenhagen, and a member of the Royal Swedish Academy of Music. Andsnes occasionally contributes written commentaries to NPR’s “Deceptive Cadence” blog, and in June 2010, he achieved one of his proudest accomplishments to date: he became a father for the first time. This is the trailer for the 2012 Ojai Music Festival, featuring the 2012 Music Director, Leif Ove Andsnes.